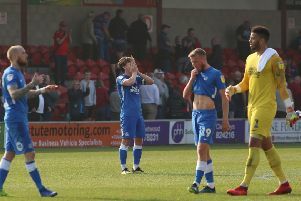 Jermaine Anderson of Peterborough United (left) celebrates scoring at Crewe last month. There was a huge blow for Peterborough United today (December 17) as teenage midfielder Jermaine Anderson was ruled out for the season with a knee injury. The 19-year-old had been enjoying the most effective season of his career. He scored six goals in 18 appearances and scored in four consecutive games in November, form that won him the Football League’s Young Player-of-the-month award. Anderson had already been ruled out of the rest of 2015 after slipping and injuring his knee in the opening minutes of the FA Cup win over Luton on December 6, but the problem is more serious than originally thought. Anderson missed the last three months of last season after breaking his foot. Posh boss Graham Westley said: “It is a devastating blow for Jermaine as an individual. As a club we have already been planning to play the rest of the season without him because so many big clubs were looking to sign him. “He has got a good head on his shoulders and will be able to bounce back from this injury with no problems. He has a great grasp of the game and is a terrific young person to work with.